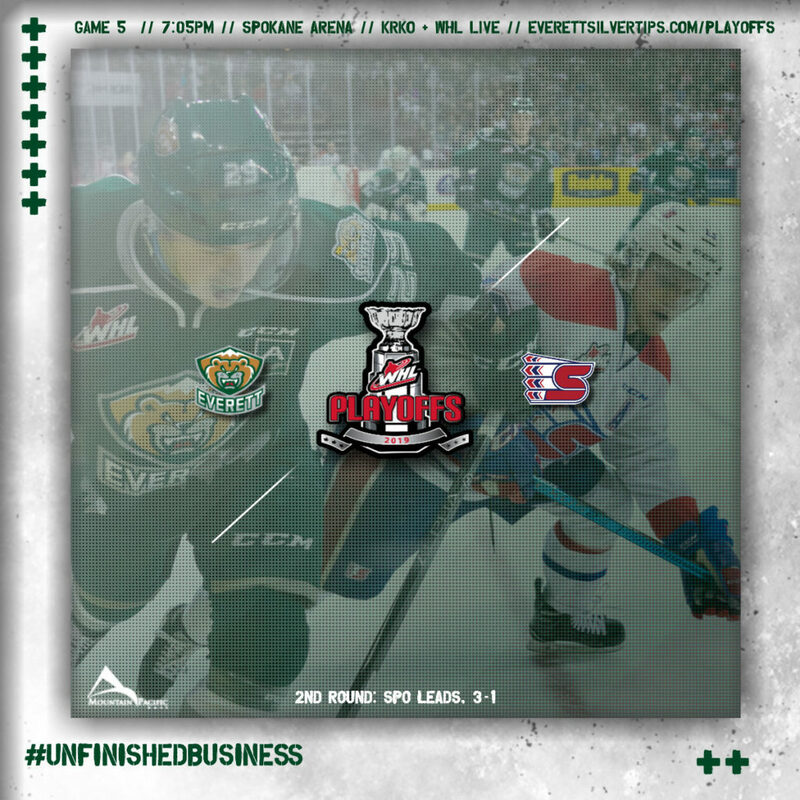 Game 5, second round of the WHL Playoffs between the Silvertips and Spokane Chiefs … it is the 5th time the two teams meet in the postseason (first since 2015, won by the Silvertips, 4-2) … the Tips went 6-0-1-1 against Spokane in the regular season and are 12-4-1-1 in Spokane, in the last five years … the Silvertips are meeting Spokane for the 5th time in the postseason … Connor Dewar and Bryce Kindopp led the Silvertips with 10 points in 8 meetings for the regular season … the Tips are 11-8 lifetime in Game 5 situations, and 3-4 on the road … a Silvertips win would force the duration of the series back to downtown Everett. 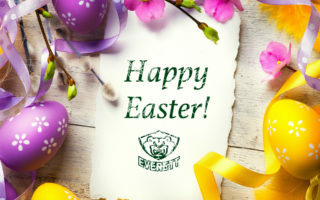 EVT 4 – SPO 1 (4-12-19) // AOTW ARENA // EVERETT, WA: After being held scoreless for the first three games of the series, captain Connor Dewar exploded for a pair of goals and added an assist to help lift the Everett Silvertips to a 4-1 victory over the Spokane Chiefs in Game 4 before, avoiding elimination and forcing Game 5 before 5,666 fans on Friday at Spokane Arena. 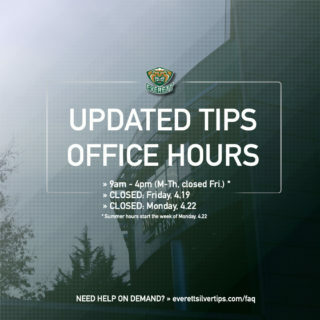 The Tips went wire-to-wire for the victory and improved to 2-1 (lifetime) when facing elimination under head coach Dennis Williams, winning their fifth straight Game 4 situation on the road. 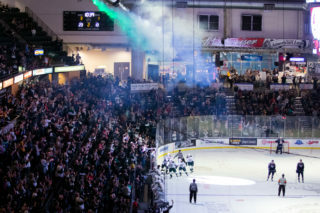 Bryce Kindopp chipped in with a pair of assists while goaltender Dustin Wolf stopped 27 shots. 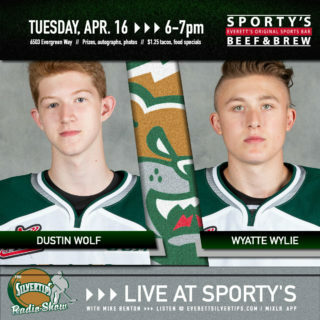 HOWLING WOLF: Dustin Wolf entered the postseason as the WHL Western Conference Goaltender of the Year … he completed his regular season as the WHL leader in wins (41), save percentage (.936), goals-against-average (1.69) … in the first round he led the WHL in GAA (1.60) and save percentage (.937) … on Apr. 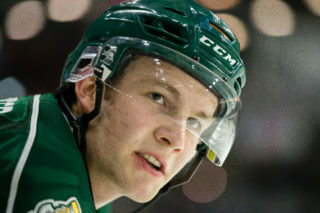 11 he was named WHL Western Conference Scholastic Player of the Year.